UPDATED: Sat., March 24, 2018, 10:40 p.m. 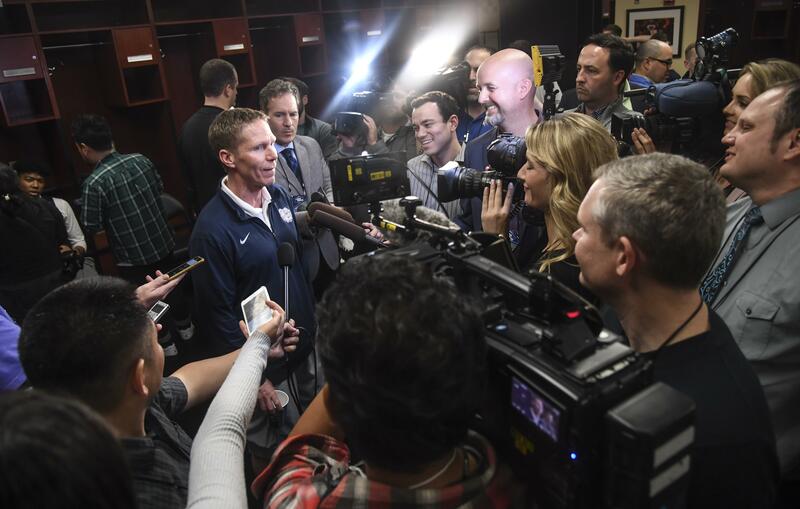 The Mountain West Conference appears to have an open door to bringing in Gonzaga, potentially as early as next season, but school officials are still working through the decision-making process. Discussions have picked up between the Mountain West and Gonzaga, and there will be more time available after the Zags lost to Florida State on Thursday in the Sweet 16. Roth said media speculation regarding the Mountain West, which has 11 basketball members, expanding to 14 or 16 teams has never been brought up in his talks with commissioner Craig Thompson. Roth also said rumors of a Gonzaga-BYU package deal are inaccurate. If Gonzaga joined the Mountain West Conference, CBSsports.com estimated it would result in about $375,000 annually from the conference’s TV contract. While discussions continue with the Mountain West, there has been movement in the West Coast Conference regarding changes with scheduling and revenue distribution to make it a more attractive option if Gonzaga decides to stay put. The Mountain West is considered stronger top to bottom than the WCC. The Mountain West is No. 9 in conference RPI, compared to the WCC’s No. 13. The Mountain West would provide tougher competition for Gonzaga, which has dominated the WCC for two decades. The Mountain West would be an upgrade, but is it significant enough to make a move? Mountain West games are televised on ESPN networks and CBS networks, including some with late-night tip times. WCC games are on ESPN’s family of networks. ESPN has played a key role in Gonzaga’s rise to national prominence over the last two decades. Basketball is the driving force in the WCC. The Mountain West is a football conference, and football is king in college athletics. Football decisions made at the conference level often have an impact on basketball. Where would Gonzaga stand in the conference’s decision-making process? The WCC is a collection of mostly smaller, faith-based institutions. The Mountain West is comprised primarily of larger state schools. Published: March 24, 2018, 7:56 p.m. Updated: March 24, 2018, 10:40 p.m.